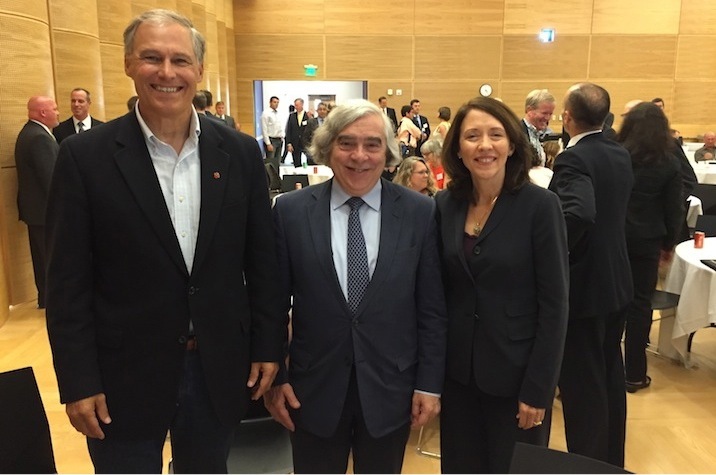 WA Governor Jay Inslee, Secretary of Energy Ernest J. Moniz, and U.S. Senator Maria Cantwell at the Northwest Regional Clean Energy Innovation Partnership Workshop on August 15. Volume I of this report summarizes the results of 14 university-hosted regional forums (from April through September 2016) that DOE participated in on regional clean energy innovation. On August 15, 2016, the Clean Energy Institute hosted one of these forums, the Northwest Regional Clean Energy Innovation Partnership (RCEIP) Workshop, at the University of Washington. Volume II is a compilation of the reports written and produced by the individual universities. The Northwest Regional Clean Energy Innovation Partnership Workshop Report is available here.